After the age of 20, your skin produces 1% less collagen each year. When combined with the cumulative effects of sun exposure, unwelcome lines and brown spots are inevitable. There’s now an effective solution to remove the signs of aging from your face, chest and hands! Laser skin resurfacing is ideal for the improvement in the appearance of pore size and skin tone and texture, giving you the youthful looking appearance you’ve always wanted. With Cynosure’s ® Smartskin+™ Laser System, dramatic results are possible without the lengthy downtime associated with an invasive facelift or other, fully-ablative laser treatments. This in-office treatment takes less than 30 minutes and provides remarkable results you will be happy to show off. 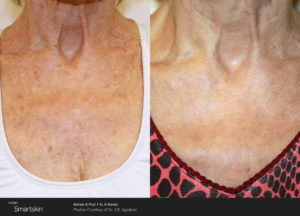 This fractional technology uses microbeams of energy to create areas of affected tissue that extend through the skin’s epidermis into the dermis while leaving the surrounding skin unharmed resulting in faster healing. This triggers the body’s natural healing process to clear away old, damaged skin cells and create new, healthy cells to take the place of the cells that have been cleared away. 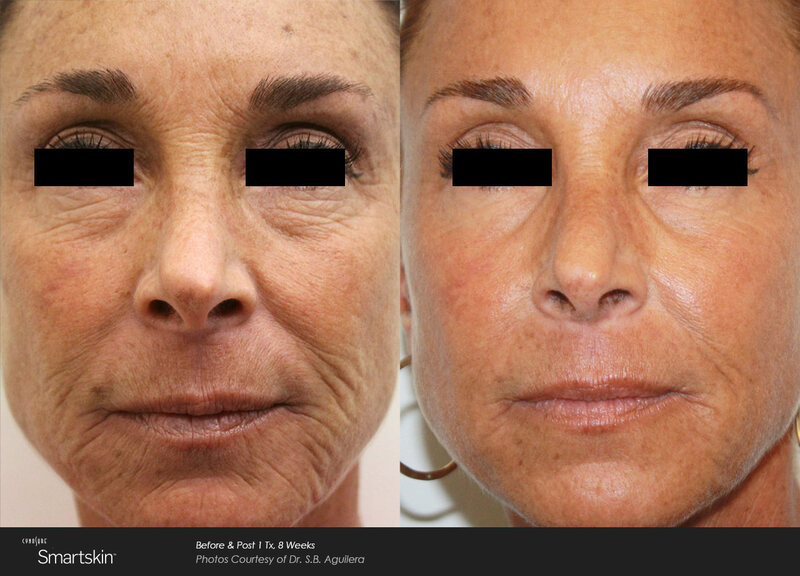 The laser also stimulates the production of new collagen & elastin deep within your skin. Over time, this will build up the support structure under your skin resulting in a younger and smoother looking appearance. 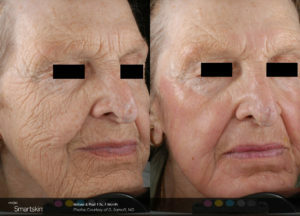 We use the advanced Smartskin+™ Laser System from Cynosure®, the leader in aesthetic lasers. 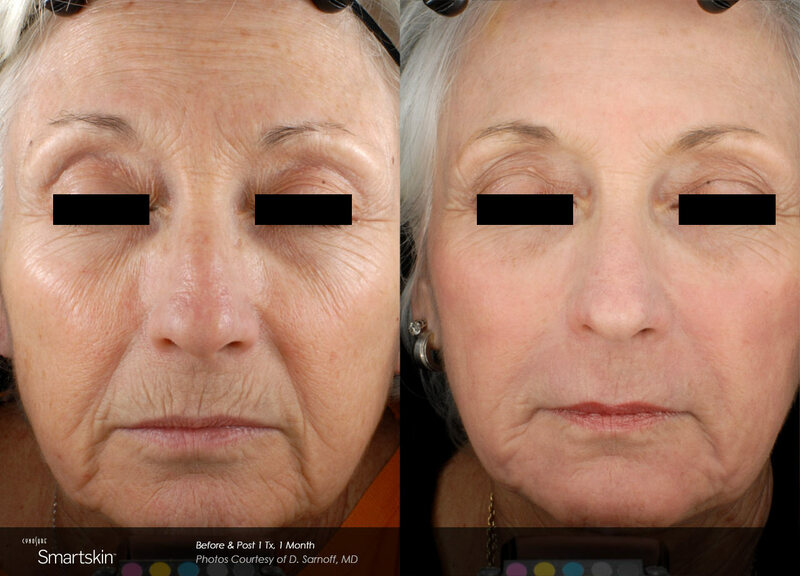 Smartskin+™ is unique in that the system allows us to tailor skin resurfacing treatments to meet your expectations. For example, you may opt for 2 or 3 ‘lighter’ treatments with very good outcomes and limited downtime, or you may want a single treatment that has a slightly longer downtime but outstanding results. Before your Smartskin+™ treatment, your doctor will typically apply a topical anesthetic over the area being treated. Once you are ready for the treatment, the topical anesthetic will be removed and the skin will be washed. You will be provided eye shields to protect yourself from the light during treatment. The treatment will begin with the provider guiding the Smartskin+™ handpiece over the treatment area. You will hear a scanning noise from the laser scanner as the handpiece is guided over your face. You may feel slight heat or a tingling sensation during the treatment. Depending on the size of the area, treatments take just 15-30 minutes. Immediately after the treatment, the area will be cooled for at least 20 minutes and we will apply an occlusive ointment which should be used over the next few days to decrease healing time. If you are a laser skin resurfacing patient please contact the office to review the pretreatment care instructions prior to the day of your treatment. Immediately after treatment, it is common for your skin to feel warm and appear to be sunburned. Swelling and pinpoint bleeding may also accompany this. Ice/cold packs should be used as instructed for swelling and discomfort. To decrease healing time and minimize discomfort an occlusive ointment should be applied to the treated area. Avoid sun exposure during the first few weeks following the procedure. A broad-spectrum (UVA/UVB) sunblock SPF 50 or greater should be used for any transient exposure. If possible, cover treated area with clothing or use a wide brimmed hat to reduce exposure. Refer to your post-treatment care instructions provided by your doctor for more detail. 1How does the Smartskin+™ Laser System work? The Smartskin+™ Laser System delivers a series of tiny microscopic laser beams to the skin. This fractionated energy penetrates the skin to clear away old and damaged skin cells. The body’s natural healing process then builds new healthy cells to take their place. The laser also stimulates the production of new collagen deep within your skin, giving you a more youthful looking appearance. Typically, only one treatment is needed for desired results. However, since treatments can be adjusted to your cosmetic and downtime expectations, you can opt for two or three “lighter” sessions. Your doctor will determine the best course of treatment during your consultation. 3What does the procedure feel like? A topical anesthetic is generally applied before the procedure, so there is minimal feeling during the procedure. Some patients report feeling heat and tingling as the laser scanner moves across your face. 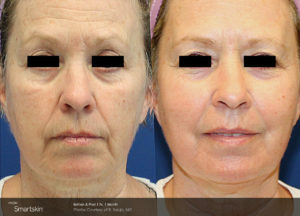 The entire face can be treated in less than 30 minutes. 4How long will the results last? With proper skin care and protection, results often last years. 5What should I expect immediately following treatment? Immediately after the treatment, your skin will feel warm and appear to be sunburned. You may also experience some swelling, which is completely normal. Your body naturally starts working by replacing the aged skin cells with new ones. After a few days, you will notice healthier-looking skin and a more even complexion. Over time, collagen will regenerate and restore the supporting structure of your skin, giving you the smooth skin you are looking for. 6When can I resume my daily activities? Since Smartskin+™ delivers micro pulses of energy you will experience a significantly shorter recovery time than with fully ablative lasers. Each tiny hole will quickly heal and in a few days you can return to your normal lifestyle. Treatments are adjustable so downtime will depend on the treatment you receive. 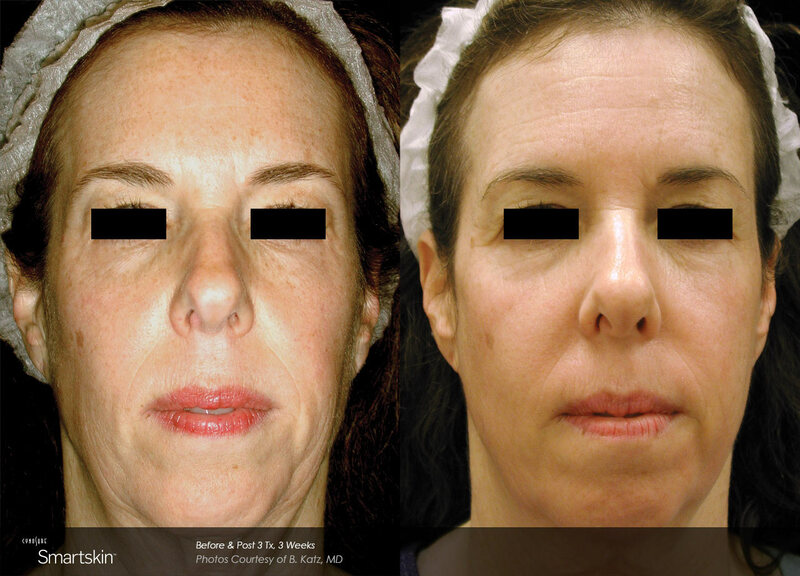 Fractional skin resurfacing has a faster recovery and has fewer side effects when compared to fully ablative resurfacing. Treatments with the Smartskin+™ Laser System are generally well tolerated. During your consultation, we will explain any potential risks and help you minimize them based on your complete medical and skin history. 8How much does the treatment cost? Smartskin+™ is unique in that the system allows us to tailor the treatments to your needs. You may opt for 2 or 3 “lighter” treatments with very good outcomes and limited downtime, or you may want a single treatment that has a slightly longer downtime but outstanding results. During your consultation we will determine your treatment plan and discuss the cost of the treatment with you.